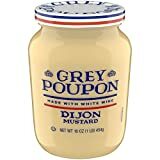 What is dijon mustard? About the ingredient dijon mustard. Including 914 recipes with dijon mustard, nutrition data, and where to find it. Mustard is a condiment made from the seeds of a mustard plant (white or yellow mustard; brown or Indian mustard; or black mustard). 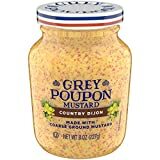 The whole, ground, cracked, or bruised mustard seeds are mixed with water, vinegar or other liquids, and sometimes other flavorings and spices, to create a thick paste ranging in colour from bright yellow to dark brown. Mustard often has a sharp, pungent flavor, as mixing the ground seed with cold liquid causes the release of the enzymemyrosinase, responsible for mustard's characteristic heat. Homemade mustards are often far hotter and more intensely flavored than commercial preparations. A strong mustard can cause the eyes to water, sting the palate and inflame the nasal passages and throat. Mustard is also a popular addition to sandwiches, hamburgers, and hot dogs. Mustard is one of the most popular and widely used spices and condiments in the world. Brought to you by Whole Foods Market. Our standards are what set us apart, and our quality is what keeps us stocking pantries, fridges and freezers with the best natural and organic 365 Everyday Value products every day. Made with organic Apple Cider Vinegar. No Sugar Added. Certified Organic, Certified Kosher, Certified Vegan. More detail Order now to save $2.11! 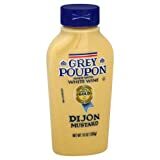 Dijon mustard is usually found in the condiments section or aisle of the grocery store or supermarket. Dijon mustard is a member of the Spices and Herbs USDA nutritional food group. How much does dijon mustard weigh? There are 928 recipes that contain this ingredient.